There has been a significant evolution in the variety of use cases for mobile Application to Person (A2P) messaging. Historically, A2P was used for alerts and as a billing mechanism and carrier for simple content and services, both for one-off downloads or actions (e.g. voting) and for recurring payments. The latter use case has declined in the past 5 years, due to a combination of the transition to an app-based economy, largely driven by card billing and by regulatory action -- in markets such as the U.S. and the UK -- against the many known fraudsters. However, the near demise of this use case has been more than offset by the emergence of alternative opportunities, many of which have themselves been created by consumer adoption of software apps and smartphones. A recent worldwide market study by Juniper Research found that revenues from Rich Communication Services (RCS) messaging will exceed $9 billion by 2022 -- that's up from an estimated $126 million in 2018. RCS, backed by Google, supports rich media content including video sharing and file transfers. The latest market research found that mobile network operator RCS revenue potential is firmly rooted in A2P services, which includes automated messages from companies to their customers. A2P RCS will bridge the gap between the ubiquity of SMS and the enhanced experience that Over-the-Top (OTT) applications bring. Juniper forecast that over 90 percent of RCS traffic will be A2P by 2022, as companies benefit from rich media functionality and large reach to enhance engagement. However, Juniper analysts discovered that initial pricing and attractive business models will likely play a pivotal role in encouraging the early adoption of this technology. Mobile network operators are advised to implement an event-based model involving a simple charge per delivered message to ease the transition from SMS to RCS. 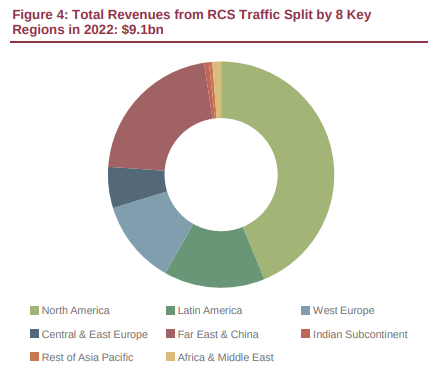 Juniper forecasts that global RCS users will near 2 billion by 2022. "Operators’ support for RCS is growing as the revenue potential becomes apparent. While the technology has been unsuccessful as a Peer-to-Peer (P2P) messaging channel, its capabilities as an A2P service will prove popular with advertisers," said Sam Barker, senior analyst at Juniper Research. Juniper recommended that all telecom service providers must consider fair usage policies while implementing new pricing models. For example, a model based on the number of RCS interactions would necessitate such a policy to guard against straining their mobile networks. Juniper Research analysis also predicted that Artificial Intelligence (AI) technology will be needed to facilitate conversational communication that minimizes response times. Until then, it suggested that APIs support interactive media-rich content to foster confidence amongst mobile service users. Additionally, it urged platforms to include fallback to SMS to ensure message termination.